Berlin’s Quasimodo is one of Berlin’s oldest jazz venues and one of the most renowned live music clubs in Europe. The club, with its incredible live music schedule, is cosy and its well-equipped café and the summer patio have allowed Quasimodo to be included into Downbeat Magazine’s ‘150 Great Jazz Venues’ list. Berlin is one of Europe’s top destinations for weekend getaways: its atmosphere, the food and the variety of German beers – lager, weiss, dark – are known all across the world. 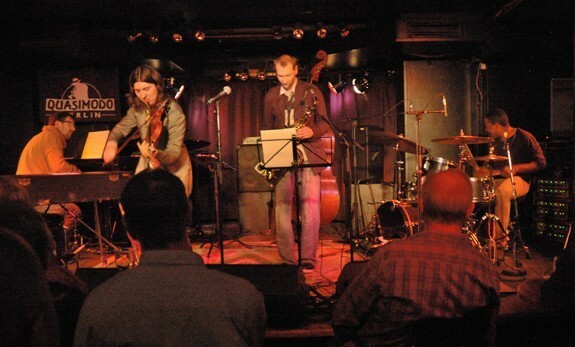 However, Berlin is a well-known city for jazz musicians and fans. Why? Mostly because of one of its oldest jazz clubs. Ladies and gentlemen welcome to Quasimodo! The ambience is traditional, as it should be for a genuine jazz venue: a jazz basement (situated under the Delphi cinema) and the Quasimodo cafè, offering fresh salads, snacks and a wide selection of beers, ideal to have a chat and refreshments before a gig. Since 2007 it has given local artists the opportunity to exhibit their paintings. The art audience regularly gathers there – perhaps after a moving experience or a visit to the theatre next door – and it appreciates the opportunity to discover new art while while enjoying a glass of wine and listening to some beautiful music. In addition, Quasimodo hosts a fantastic Mediterranean mansion garden-style patio, providing a perfect environment with pillars, vases and decorated walls for all those who want to enjoy a relaxing moment outdoors. Since 1975 the club has been presenting some of the best jazz artists around, allowing them to enjoy the direct contact with the audience, which may count up to 350 fitting in the club! Doors open at 9pm and sets start at 10pm (due to the adjoining theatre ‘Vagantenbühne’ having its shows). The entry charge varies depending on the performer and tickets can be purchased at both Quasimodo cafè and regular concert tickets counters. It is also possible to reserve tickets, which will be deposited at the evening counter, or even buy them online. A solid reputation, an intriguing jazz lineup filled with world’s first class acts (it also hosts progressive rock, disco and world music nights), a cafè, ideal to experience the German tradition of snacks and beer, and the summer-sun enlightened patio. Quasimodo is all this and a lot more. If you are a local, visit the venue once and you will keep coming back. If you are a tourist visiting the city, make sure to write this name down and stop by. You will love it! I will be visiting Berlin from October 10 through the 16 and would very much like to get tickets for the Preston Reed Concert on October 14, 2018. After trying unsuccessfully for several weeks to purchase tickets on line from “Dodo Tickets.DE,” I contacted them directly and was told that they do not sell tickets to customers in the U.S. as its too costly and inconvenient. Is there anyway I can buy or reserve 2 tickets for the concert directly from Quasimodo or another vendor using a credit card, PayPal, or any other means?